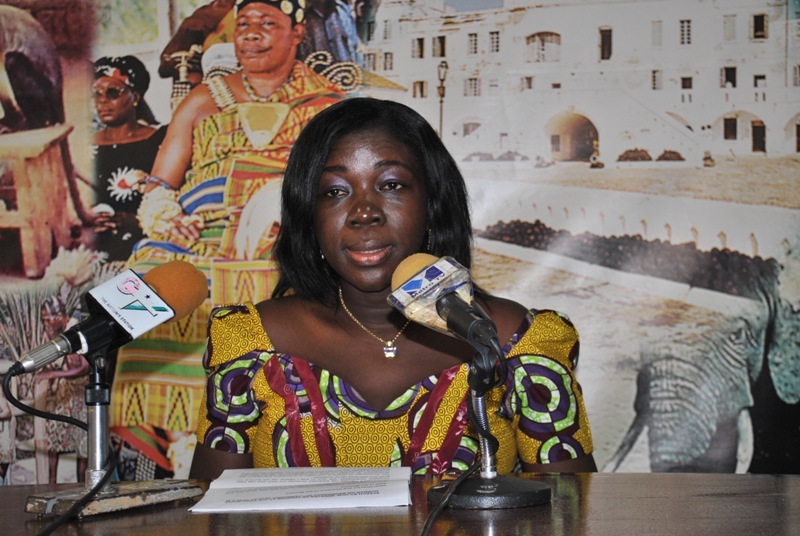 Open Letter to Ghana Tourism Board , how would you like to move from 2.5 billion to 20 billion revenue ? Today , I came across a tweet by Citi Fm on the inauguration of new tourism board of Ghana , my first thought was maybe, just maybe, this new board will look into how we can use technology as an efficient and cost effective tool to boost tourism revenues. Tourism is one of the highest income earners for the Ghanaian economy , it is in fact the 4th largest Foreign Exchange earner for Ghana . 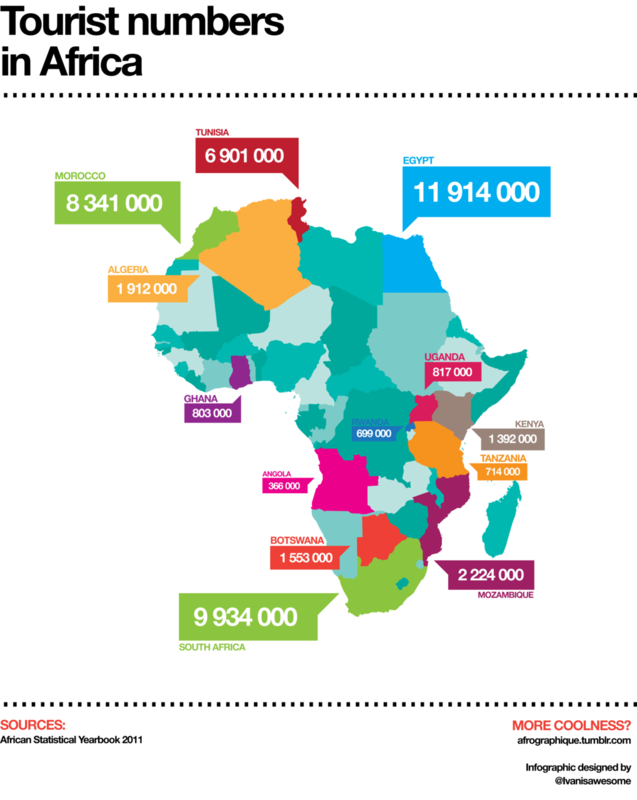 Sadly according to the World Tourism Org only 5% of tourist actually visit Africa . In that small pie Ghana is receiving about 1% or less . So lets face it, we are not competing well as a tourist country , how do we turn 2.5 billion to 20 , 40 or 50 billion USD ……. First of All be easy to find !!! First of all to increase revenue , we need to increase the numbers that visit Ghana and be found when holiday destinations are being decided . Over 70 percent of holiday seekers are looking to the web and internet for information on the holiday locations, for Ghana to compete favorably and attract more than the 800,000 tourists it attracts annually we need to be found by holiday seekers when they are looking for holiday destinations!!!! Google “holiday in Africa” or “holiday sites in Africa” and the first page brings up links to Kenya, Tanzania and South Africa sites…there is no mention of Ghana until the 10th page. Google “West African holiday” and there are more mentions of Gambia and Mali than there is Ghana . Bottom line is that the information online about Ghana, is not very visible or enough to enable us to be found and to persuade holiday makers that we are indeed the destination of choice ahead of our competitors in the same space. Ever wondered why some pages are ranked number 1 in a search whilst others are not . 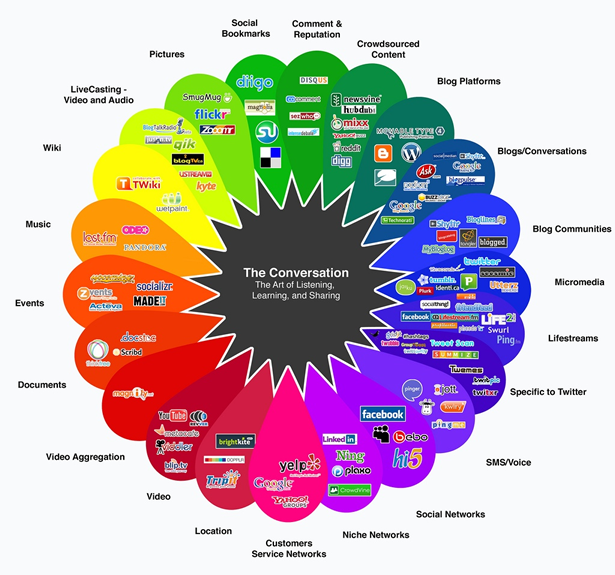 It all depends on type of content of the website and the number of mentions of the site on the web . We need to begin to teach and implement the art of optimizing the content of website and pages to make it easier for the web pages to served up readily in a search when a user makes a relevant search to service providers. Implement comprehensive web , internet and social media strategy . 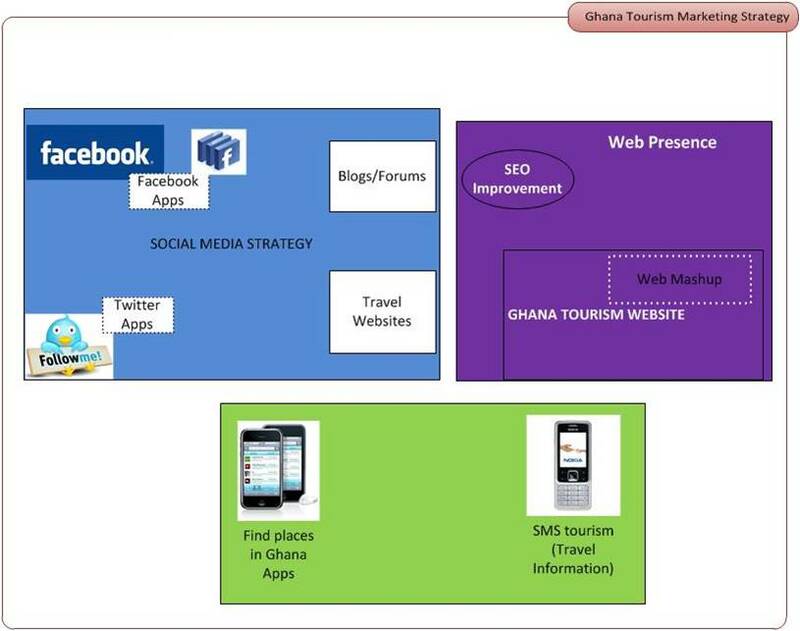 This is beyond just having a website, Facebook and twitter pages and building mobile apps,solutions must enable Ghana actively engage with the potential tourist and holiday seekers to enable them favor Ghana as a tourism destination. Additionally provide tourist already on holiday tools for a great holiday experience with the right and targeted information. There a many social media channels , there needs to be planning on where the average tourist goes and how we can engage and persuade . Identify the relevant mashup to build which would work online and via mobile phones to enable tourist plan their vacations or to find the relevant tourist locations or services or even other tourist in their general location. 4sqoogle is a Google Map that shows the nearest restaurants, bars, clubs and shops using the foursquare API. Provide the platform and requisite information to facilitate the ease of which bloggers and visitors can recommend their experience in Ghana. Partner with Blogging Ghana , they will be happy to help. Who is already using technology social media to boost tourism and winning? 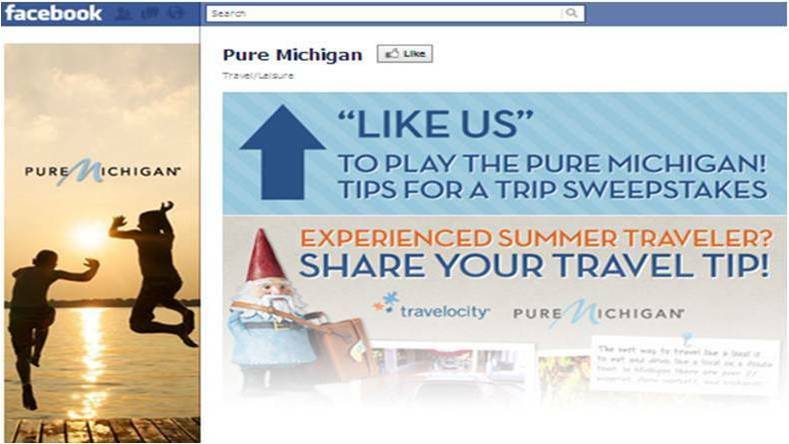 The award-winning Pure Michigan Facebook page showcases upcoming events in Michigan, offers a sweepstakes, the ability to connect with Michigan’s tourism experts, and even an F-commerce extension with the ability to shop directly in the Michigan online store. As a result the entire Pure Michigan campaign has attracted 7 million new, out-of-state visitors to the state and generated $3.29 in tax revenue for every 1 dollar spent on Pure Michigan advertising. 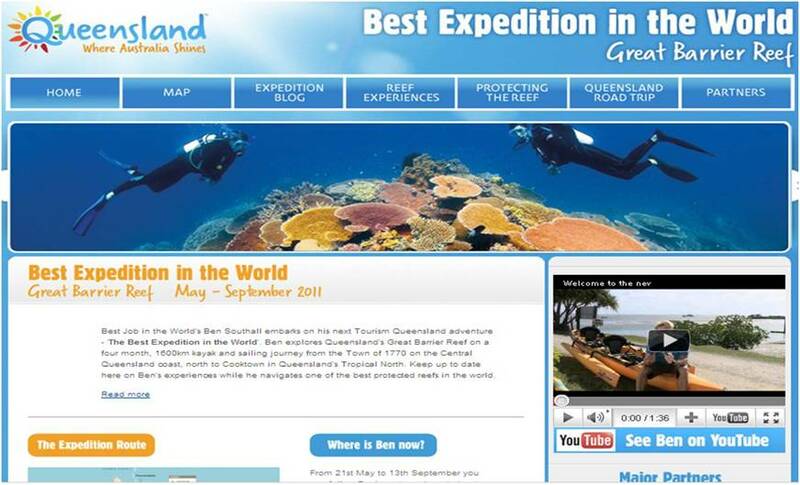 Queensland’s The Best Job in the World campaign is a well known success story, based around recruiting applicants for a six-month assignment to become a Great Barrier Reef island caretaker and the winner wrote a weekly blog reporting on his adventures. It brought 8.4 million website visitors and almost 35,000 job applications, at a time when Australian tourism was down; tourism in Queensland tourism rose 20% with 50% of Australian trips now including a Queensland component. Visit Japan 2010 /Visit Jamaica have a Facebook page that aggregates all the travel info and links you’ll ever need! 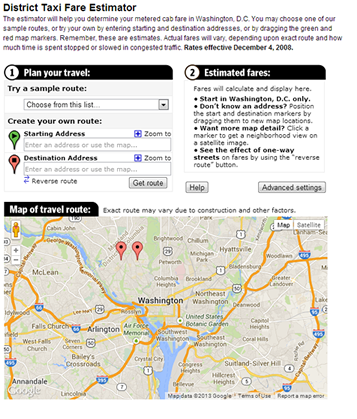 The layout is clean and information is organized. It’s the first place (not Google!) I would go to when planning for a Japan trip. Get updates through the page, ask questions and share your experiences with others. Who would you trust more, the tips and views of a fellow tourist or the tourism board? New Zealand has a YouTube channel that not only shows you great videos, it helps you plan your trip as well .The channel links you to information about New Zealand, getting to New Zealand, places to stay, and a New Zealand map. 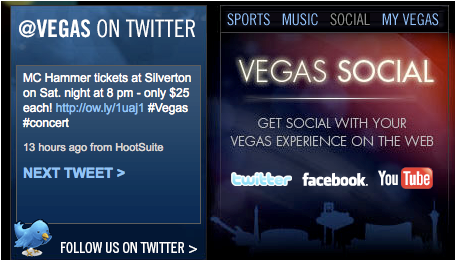 Las Vegas tourism board has dedicated a significant amount of space on its official site to direct traffic to its social media accounts. It is crucial to engage potential tourists outside of a website. People are spending hours on Facebook every day, but maybe 15 minutes on websites, and only when they need them. 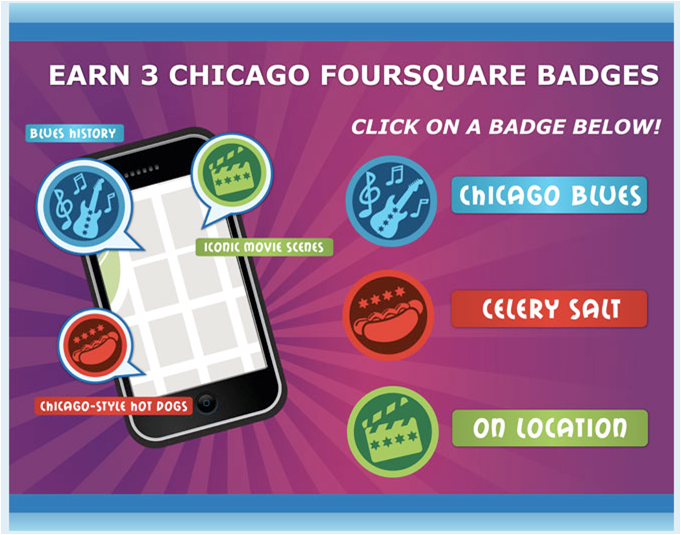 Social sites are a great opportunity to let organizations become a part of consumers’ daily life.
. Chicago users of the Explore Chicago section on Foursquare can earn three badges, themed around the city, by visiting locations such as historic sites, film locations, restaurants and clubs. This is to help boost awareness of both the popular and less well known tourist attractions. With more Smartphone users wanting travel-related apps, it is a good opportunity for tourism boards to start thinking of how they can value add people on the go. Well, Tourism Vancouver is already doing it! 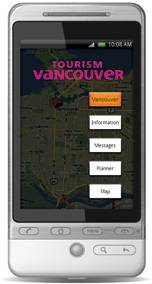 It has launched an interactive tourist guide with integrated street navigation of Vancouver and Whistler. More Card Payments in Africa? Hi Ethel Cofie, This is so true. We would like to circulate this to all tour guides in West Africa through the 1st edition of our newsletter “The Golden Arrow”. We need your permission. We hope you will approve. A good post, Ethel, and I appreciate the data visualisations. One caveat, should we be concerned about the type of tourism? Egypt tops the chart partly because of its history, but much more so because of the Red Sea resorts which are just sun, sea, sand and no culture. Should one encourage that sort of tourism? 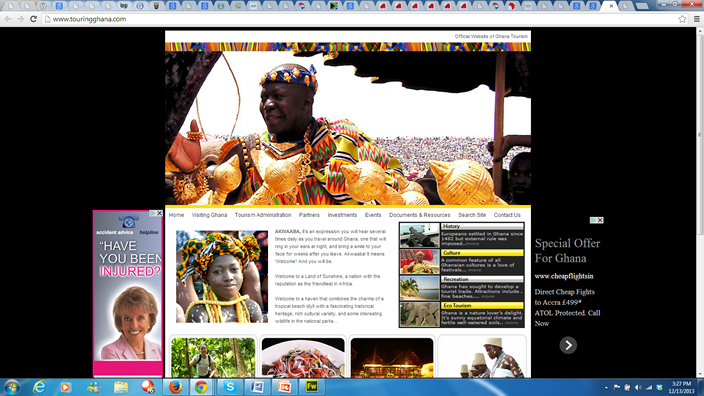 AFAIK much tourism to Ghana is diasporic and values the cultures and history of Ghana, which I admire. I have only once been to Ghana and I loved walking around Jamestown etc where I was the only ɔb’roni in sight but engaged in many lively and friendly conversations. Just had to laugh when I was attending a local children’s event at the Golden Tulip, went to buy some water by the poolside and there were all the white folks, like hippos round a lake! Thanks Ethel, itraveltoghana.com with their mobile app helping provide this solution. TraveltoGhana is a digital tourism app that facilitates easy access in tourism and hospitality in Ghana.